BARKSDALE, William, (brother of Ethelbert Barksdale), a Representative from Mississippi; born in Rutherford County, Tenn., August 21, 1821; attended the University of Nashville; studied law; was admitted to the bar in 1839 and commenced practice in Columbus, Lowndes County, Miss. 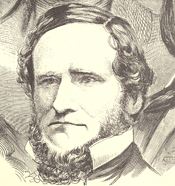 ; for a time was editor of the Columbus Democrat; served in the Mexican War as quartermaster of the Mississippi Volunteers; delegate to the Democratic National Convention at Baltimore in 1852; elected as a Democrat to the Thirty-third and to the three succeeding Congresses and served from March 4, 1853, until January 12, 1861, when he withdrew; entered the Confederate Army during the Civil War as colonel of the Thirteenth Regiment of Mississippi Volunteers; promoted to the rank of brigadier general on August 12, 1862; commanded a Mississippi brigade in Longstreets corps; killed in the Battle of Gettysburg, Pa., July 2, 1863; interment in Greenwood Cemetery, Jackson, Miss. McKee, James W. William Barksdale and the Congressional Election of 1853. Journal of Mississippi History 34 (May 1972): 129-58; McKee, James W. William Barksdale and the Congressional Election of 1853. Journal of Mississippi History 34 (May 1972): 129-58.